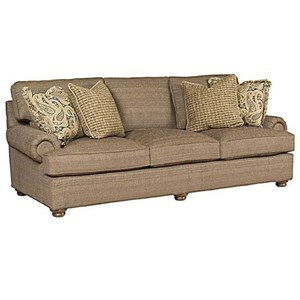 A comfortable and casual piece for the whole family to relax, this sofa eases both the body and mind. Customize its style by choosing the arm, back, leg, and upholstery type on this sofa. 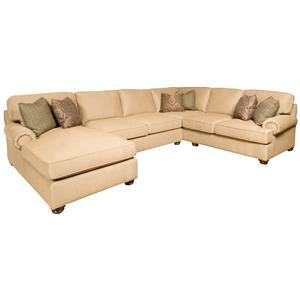 Comfort down seats and back pillows wrap the body with soft and supportive padding you can depend on for years to come. The Henson Chair & 1/2 by Biltmore at Morris Home in the Dayton, Cincinnati, Columbus, Ohio, Northern Kentucky area. Product availability may vary. Contact us for the most current availability on this product. Leg or Skirt All legs are built-in and double-doweled, glued & screwed to the side rails. Choose from turned leg, modern leg, or skirt. 1) Choose from rolled panel arm, rolled sock arm, track arm, or English arm styles. 2) Select loose back cushions with boxed-edged border or knife-edged border, or opt for the attached seat back with boxed-edged cushions. 3) Choose from turned wood legs, tapered block legs, or a skirted base. You can also choose to upholster this piece in your choice of fabric, leather, or a two-tone fabric and leather combination. The Henson collection is a great option if you are looking for Casual furniture in the Dayton, Cincinnati, Columbus, Ohio, Northern Kentucky area.